Bourbon’s House is the brainchild of Camille Bourbon who, with the help of her brother Marin, is bringing a timeless English classic to the heart of Lyon. The doorway of Bourbon’s House is laced in green vines of white flowers. Paneled windows betray an orange glow from the exposed lightbulbs inside, flooding the cream and grey space with a needed dose of comfort. Bourbon’s House offers traditional English afternoon tea selections, including sandwiches, scones, and pastries. 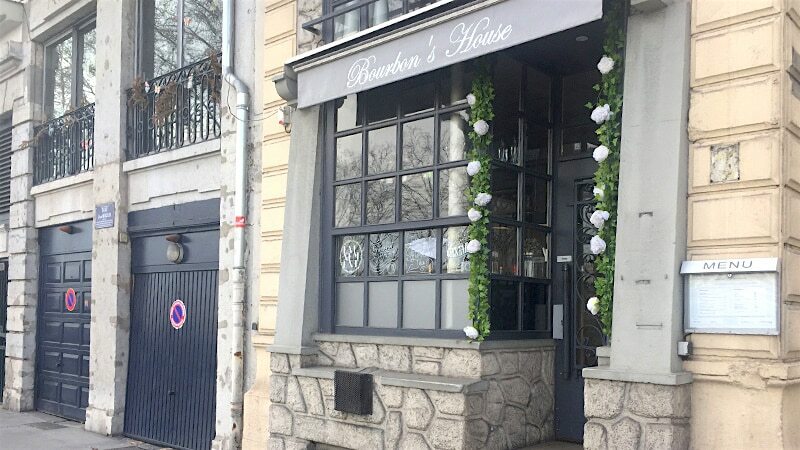 The newly opened Bourbon’s House is a French-English lounge in the heart of Lyon, on Rue Gentil around the corner from the Cordeliers metro. It’s a “cozy corner” of the Presqu’île, meant to bring friends and family together to savor life’s small moments, and some small pastries, too. Opened by brother and sister duo Camille and Marin Bourbon, Bourbon’s House is bringing the longtime English tradition of afternoon tea to Lyon, in its most classic and elegant form. “We wanted to create a cozy corner, so it’s like going into a little hotel,” said Camille, who manages the lounge. Guests are ushered in through the small, downstairs bar area, and up the stairs to the second-floor lounge. White walls and light wood tables for two fill the small space. Perfectly-arranged pastel flowers in glass jars serve as centerpieces, setting off the grey wingback armchairs on either side. On this day, the two-person tables have been pushed together on the right side of the room, creating a banquet fit for a feast. And that’s exactly what we’re about to get. Next to each bouquet, a three-tiered tower displays our afternoon tea assortment. Three sandwiches on the bottom, three desserts in the middle, and a parfait on top. Scones, jams, and a scattering of tea leaves litter the table in between our plates. We’re presented with our choice of teas, which includes everything from jasmine to rooibos to traditional English breakfast. Bourbon House’s teas come from the Rare Tea Company, Camille explains, a business that sources direct trade teas from all over the world. “It’s a company that has really important values and is very engaged directly with producers,” she said. 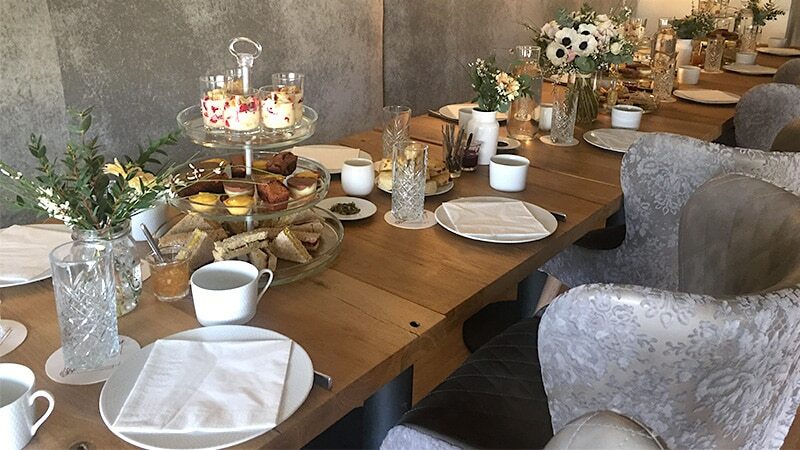 We’re served our tea in pristine white teapots and advised to help ourselves to the assortment that looks much too pretty to eat, starting with the sandwiches on the bottom and working our way up to the parfaits. On the menu today, in addition to this strawberry shortcake-esque trifle, are berry scones, a mix of brie, curry, and capocollo sandwiches, lemon curd tartlets, hazelnut brownies, and millionaire shortbread which, in case you’re not familiar, includes a large amount of very sticky caramel. Talk about a warm welcome. Camille has been interested in the hospitality business ever since she received her BAC, and her international influences followed shortly after. When she finished her studies, she worked in hospitality services in England for eight months before a three-month internship at the Naval Museum in Washington, D.C.
Bourbon’s House is located on the Presqu’île, just down the street from the Cordeliers metro stop. She then moved on to Switzerland to pursue a degree in Hospitality Management at the École Hôtelière de Lausanne. But it wasn’t until a job at the Eurostar Business Lounge in London in 2015 that she was fully integrated into the English afternoon tea tradition. And so it happened that when she returned to Lyon it was in the hope of opening her very own space in the center of the city. 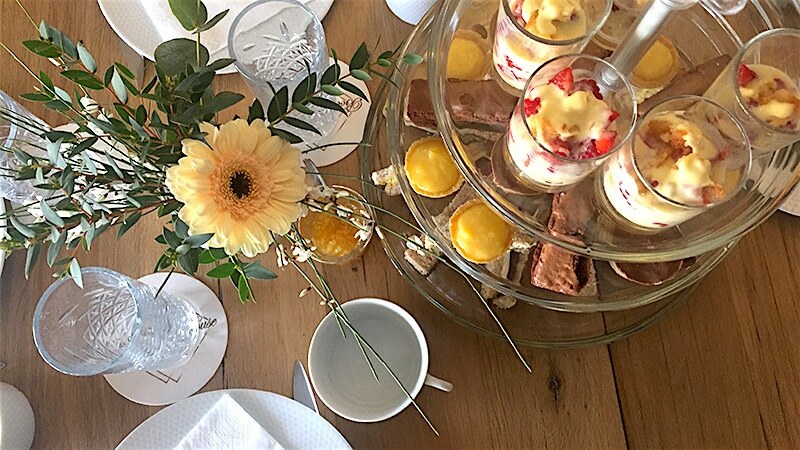 When it came time to decide what to serve, afternoon tea was a no-brainer. Because the food is all made in-house, the Bourbon House menu changes depending on the products they receive. In addition to afternoon tea, they also offer breakfast, lunch, snacks, gourmet aperitifs, and brunch. Camille’s brother, Marin, is the lounge’s bartender and always on hand for drinks at the bar or the “Not so serious lunch” upstairs. But the afternoon tea is where Bourbon’s House really shines. By reservation only, but with no minimum number of attendees, the English-turned-French classic is perfect for a relaxed catch-up or celebration. Bourbon’s House gets their tea from the Rare Tea Company, a business that sources its products through direct trade relationships. Bourbon’s House will soon be adding an “Epicerie Fine” to the mix, selling their own products and those imported from England, including shortbread, biscuits, jams, chutneys, peanut butter, tea, cheese, candy and more. They’ll also be looking to hosts events like garden parties and expose local artists’ works on their walls. But today, it’s all about the tea, and the three-level pastry stand that comes with it. Descending from our second-floor pastel castle, we make our way out onto the street, newly imbued with a distinct sense of calm and a brewing food coma to last us until next Tuesday.